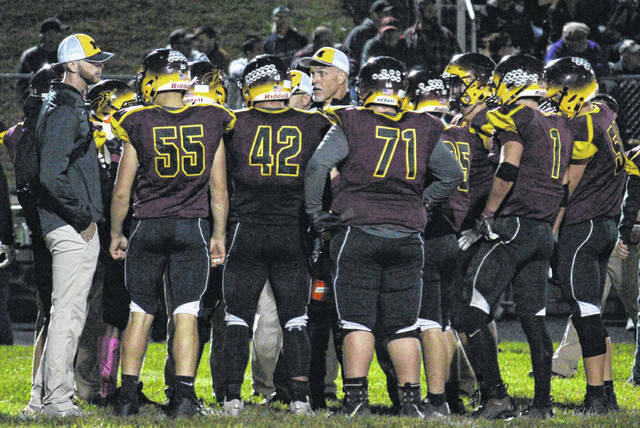 Meigs head football coach Mike Bartrum talks to his team during a break in the action, in the Marauders’ non-conference Week 8 game in Rocksprings, Ohio. Last Week: Trimble defeated Federal Hocking 69-0, in Glouster; Southern lost to Waterford 42-7, in Waterford. Last meeting between the teams: Oct. 6, 2017. Trimble won 21-12 in Glouster. THS offense last week: N/A. SHS offense last week: 94 rushing yards, 47 passing yards. THS offensive leaders last week: N/A. SHS offensive leaders last week: QB Logan Drummer 8-of-15, 47 yards, 1TD, 1INT; RB Trey McNickle 23 carries, 80 yards; WR Brody Dutton 3 carries, 27 yards. THS defense last week: N/A. SHS defense last week: 249 rushing yards, 64 passing yards. 1. The Tornadoes have just one win all-time against Trimble. That 19-8 SHS victory came in 1973, which was Trimble High School’s first year of existence. The Tomcats avenged that loss in the following season and has won all-27 games since the series resumed in 1992, including the first ever postseason meeting between the schools in 2016. 2. Trimble has shut out Southern seven times and has never allowed the Purple and Gold to score more than 28 points in a game.THS has pitched seven shut outs this season, including two straight. 3. Last week’s SHS setback ended the Tornadoes string of nine straight games with double-digits in the scoring column. In fact, it was the first time since Waterford held SHS to six points in Week 8 of 2017, that Southern hasn’t found the end zone at least four times. 4. Southern has scored 47 touchdowns this season, all by seven players. Trey McNickle leads the way with 20, followed by Gage Shuler with nine and Brody Dutton with seven. Logan Drummer and Weston Thorla have found the end zone five times each, while Alex VanMeter has one touchdown. 5. Trimble enters the week at third in the Region 27 playoff rankings, with top-ranked Canal Winchester Harvest Prep as the only other 7-win team in the region. Southern fell to 10th in Region 27, but is one of five teams entering Week 9 with a six in the win column. Last Week: Wellston lost to Athens 39-14, in The Plains, Meigs lost to Point Pleasant 55-13, in Rocksprings. Last meeting between the teams: Oct. 20, 2017. Wellston won 45-43OT in Wellston. Current head-to-head streak: Wellston has won 2 straight. MHS offense last week: 19 rushing yards, 244 passing yards. MHS offensive leaders last week: QB Coulter Cleland 21-of-32, 244 yards, 1TD; RB Zach Bartrum 7 carries, 12 yards; WR Ty Bartrum 7 receptions, 46 yards. MHS defense last week: 367 rushing yards, 241 passing yards. 1. Meigs holds a 25-20-1 record over Wellston in all-time meetings. The Golden Rockets came away with a 43-12 victory in their last trip to Rocksprings, on Oct. 21, 2016. 2. The Marauder defense came up with its third pick-6 of the season last week. Meigs has only intercepted one pass it hasn’t returned for a touchdown this season. The MHS defense also has three takeaways via fumble recovery this year. 3. Meigs has thrown for 1,812 of their 2,474 yards this year, along with 17 of their 26 offensive touchdowns. MHS freshman Coulter Cleland leads the MHS passing game with 128 completions on 221 attempts, with 1,770 yards, 16 touchdowns and seven interceptions. 4. Seven Marauders have combined for the team’s 30 times this season. Cole Adams leads the team with eight touchdowns, followed by Zach Batrum with six. Landon Acree and Weston Baer have found the end zone four times apiece, Abe Lundy and Ty Bartrum have three scores apiece, while Coulter Cleland has been in the end zone twice. 5. Meigs is mathematically eliminated from the Region 15 playoff picture, with the Marauders entering the week at 19th in the rankings. In Region 19, Wellston is 14th and enters the week as one of five 3-5 teams in the region. Last Week: Eastern defeated Miller 25-8, in Tuppers Plains; Belpre lost to Valley 28-21, in Lucasville. Last meeting between the teams: Oct. 20, 2017. Belpre won 49-20, in Tuppers Plains. Current head-to-head streak: Belpre has won 5 straight. BHS offense last week: 298 rushing yards, 56 passing yards. BHS offensive leaders last week: QB Connor Baker 4-of-5, 45 yards, 1TD; RB Jesse Collins 21 carries, 110 yards, 1TD; WR Walker Weick 2 receptions, 32 yards, 1TD. EHS defense last week: 64 rushing yards, 102 passing yards. 1. Since BHS joined the TVC Hocking, the Golden Eagles hold a 5-3 record over EHS. Eastern fell by just five points, 25-20, in its last trip to Belpre on Oct. 21, 2016. 2. Eastern is currently on a four-game winning streak, their longest since winning the last four games of the 2004 campaign. The Eagle win-streak has featured a pair of 30-plus-point shut outs, a one-point victory, and a 17-point win last Friday. 3. Belpre had its five-game win streak ended last week. In the Golden Eagles’ win streak, they scored at least five touchdowns in ever game. 5. EHS enters Week 9 at 12th in the Region 27 playoff rankings, and is one of four 4-4 teams in the region. The Golden Eagles are 13th in Region 23 and are joined by four other 5-3 teams in the region.